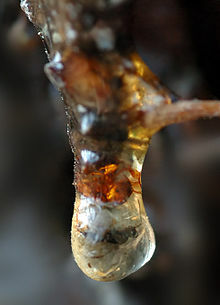 Notable examples of plant resins include amber, Balm of Gilead, balsam, Canada balsam, Boswellia, copal from trees of Protium copal and Hymenaea courbaril, dammar gum from trees of the family Dipterocarpaceae, Dragon’s blood from the dragon trees (Dracaena species), elemi, frankincense from Boswellia sacra, galbanum from Ferula gummosa, gum guaiacum from the lignum vitae trees of the genus Guaiacum, kauri gum from trees of Agathis australis, hashish (Cannabis resin) from Cannabis indica, labdanum from mediterranean species of Cistus, mastic (plant resin) from the mastic tree Pistacia lentiscus, myrrh from shrubs of Commiphora, sandarac resin from Tetraclinis articulata, the national tree of Malta, styrax (a Benzoin resin from various Styrax species), spinifex resin from Australian grasses, and turpentine, distilled from pine resin. Amber is fossil resin (also called resinite) from coniferous and other tree species. Copal, kauri gum, dammar and other resins may also be found as subfossil deposits. Subfossil copal can be distinguished from genuine fossil amber because it becomes tacky when a drop of a solvent such as acetone or chloroform is placed on it. 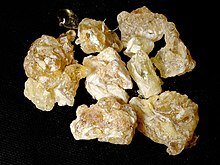 African copal and the kauri gum of New Zealand are also procured in a semi-fossil condition. The word resin comes from French resine, from Latin resina “resin”, which either derives from or is a cognate of the Greek ῥητίνη rhētinē “resin of the pine”, of unknown earlier origin, though probably non-Indo-European. Some resins when soft are known as ‘oleoresins’, and when containing benzoic acid or cinnamic acid they are called balsams. Oleoresins are naturally occurring mixtures of an oil and a resin; they can be extracted from various plants. Other resinous products in their natural condition are a mix with gum or mucilaginous substances and known as gum resins. 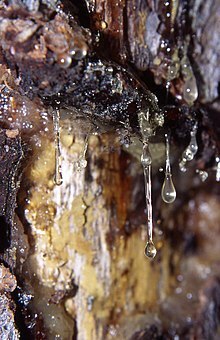 Several natural resins are used as ingredients in perfumes, e.g., balsams of Peru and tolu, elemi, styrax, and certain turpentines. ^ a b Fiebach, Klemens; Grimm, Dieter (2000). “Resins, Natural”. Ullmann’s Encyclopedia of Industrial Chemistry. Weinheim: Wiley-VCH. doi:10.1002/14356007.a23_073. ISBN 978-3-527-30673-2. ^ Bittrich, V.; Amaral, Maria C. E. (1996). “Flower morphology and pollination biology of some Clusia species from the Gran Sabana (Venezuela)”. Kew Bulletin. 51 (4): 681–694. doi:10.2307/4119722. ^ Gonçalves-Alvim, Silmary de Jesus (2001). “Resin-collecting bees (Apidae) on Clusia palmicida (Clusiaceae) in a riparian forest in Brazil”. Journal of Tropical Ecology. 17 (1): 149–153. doi:10.1017/s0266467401001092. ^ Simone-Finstrom, M.; Spivak, M. (2010). “Propolis and bee health: The natural history and significance of resin use by honey bees”. Apidologie. 41 (3): 295–311. doi:10.1051/apido/2010016. “Queen Hatshepsut’s expedition to the Land of Punt: The first oceanographic cruise?”. Dept. of Oceanography, Texas A&M University. Retrieved 2010-05-08. ^ “resin, n. and adj”. OED Online. Oxford University Press. September 2014. Retrieved 2 December 2014. ^ “resin (n.)”. Online Etymology Dictionary. Retrieved 2 December 2014. ^ Kozowyk, P. R. B.; Langejans, G. H. J.; Poulis, J. A. (2016-03-16). “Lap Shear and Impact Testing of Ochre and Beeswax in Experimental Middle Stone Age Compound Adhesives”. PLOS ONE. 11 (3): e0150436. doi:10.1371/journal.pone.0150436. ISSN 1932-6203. ^ “Non-wood forest products from conifers – CHAPTER 6”. www.fao.org.